A woman was stabbed to death yesterday at the cottage in the back of this house at 1635 Eames St. in Wahiawa. 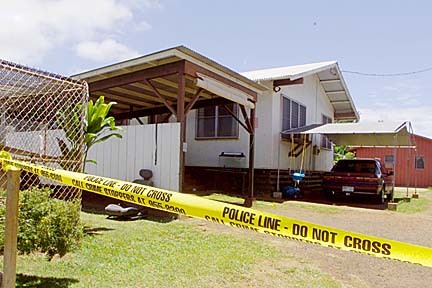 Police may seek second-degree murder charges today against a 44-year-old man who allegedly stabbed his girlfriend yesterday morning at their Wahiawa home. The 53-year-old woman suffered multiple stab wounds to the upper front portion of her body, and was taken in critical condition to Wahiawa General Hospital where she was pronounced dead at 9:52 a.m., police said. "She was able to tell officers the suspect stabbed her before she was taken to the hospital," said acting homicide Lt. Cliff Rubio of the Honolulu Police Department. The woman was identified by relatives as Ruby Mabang, and described as quiet. Her adult son lives on Oahu, and her daughter resides on the mainland, relatives said. Dozens of the woman's other relatives gathered at Wahiawa General Hospital after the stabbing. Earlier, the couple had been heard arguing and screaming, and police were initially responding to a domestic quarrel when they received another call. Police said a family member who lived in the main house, whom relatives say was Mabang's brother-in-law, had gone to the couple's cottage and discovered the woman had been stabbed and told others to call police. Police arrived and banged on the door, calling the suspect to come out with the victim. The man came to the door with the woman, who was apparently bleeding from the chest. Police ordered the man to lie on the ground, and he complied, Rubio said. He was arrested without incident, and booked at the Wahiawa Police Station. Police were attempting to get a warrant to search the home for the murder weapon yesterday afternoon. The couple had lived together on and off for five years, police said. They were living in a cottage at 1635 Eames St. on a property with three other houses occupied by the victim's sister, brother and father, family members said. Family members said they know very little about the man's history. The suspect had a police record, Rubio said, although details were not available.